This month marks the 30th anniversary of Just Us Books. 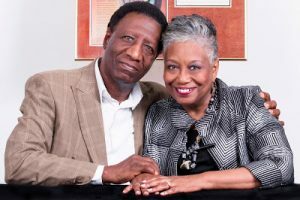 Founded by Wade and Cheryl Hudson, this ground-breaking company not only showed that Black children’s books were being overlooked, but that publishers were missing out on bestsellers. Their debut title, AFRO-BETS ABC Book, sold more than 5,000 copies in three months. 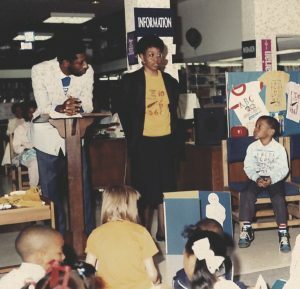 From its beginning, Just Us Books proved that authentic Black children’s books were vital and longed for. Today, there’s a lot of conversation about diversity, equity and inclusion. The movement stands on the shoulders of visionaries like the Hudsons who continue to open doors, publish titles that center children of color and push for change. Let’s show our support by spreading the word about Just Us Books. Connect on Twitter – @JustUsBooks and on FaceBook – www.Facebook.com/JustUsBooks. Buy and share their titles which span from books for preschoolers to young adults – http://justusbooks.com/. Share their posts and your reflections on what Just Us Books means. The second generation of the Hudson publishing team, adult children Katura and Stephan, have grown up in the business. Katura will release her second picture book, I’m a Big Sister Now, this month. Stephan’s photography is included in the acclaimed anthology edited by Wade and Cheryl, We Rise, We Resist, We Raise Our Voices (Crown Books for Young Readers). To celebrate 30 years of their family company, Katura and Stephan interview their mom and dad. We’re honored to celebrate them here. Thank you, Just Us Books, for loving us. KATURA: The good thing about interviewing your family is you can skip the formalities and get straight to the questions. Let’s start with your newest project We Rise, We Resist, We Raise Our Voices, a collaboration between Just Us Books and Crown. It received four starred reviews and was called a love letter from kidlit’s brightest stars. I love that! In your introduction, you talk about growing up in segregated communities and being “embraced by accepting arms, motivated by encouraging words.” That encouragement made you know you were loved – even as racism, prejudice and injustice threatened to make you feel otherwise. How did that feeling shape your approach to creating this anthology? WADE: Jim Crow was a monster that was created to strip away the humanity of Black people. Despite all that it did and could do to accomplish that, Black people found ways to not only maintain their humanity, but to laugh, enjoy life, plan, build families, organizations, businesses, to love and embrace hope for a better tomorrow. There was no will to give up, even if sometimes, we had to retreat and come back another day. It is astonishing to even contemplate the brutal treatment Black people were forced to endure for centuries. But, we fought back, we endured, we established communities, we made major cultural contributions. It was that legacy that embraced us during the 60s and offered us love, hope and inspiration. That legacy is here today for young people to grasp. There are other legacies, too: the women’s movement, immigrants’ rights movement, labor movement, children’s rights movement, and others that make up a greater legacy that assure us when we rise, we resist, we raise our voices ― we can hope for a better future! CHERYL: Having solid, nurturing and supportive parents provided me with the firmest of foundations. Although I attended segregated, all-black schools, churches and social organizations from until I was 18, I never felt “less than” anyone else. I knew I just didn’t have as much opportunity. I became more socially conscious during the mid-60s during my college years at Oberlin, a predominantly white institution. Reading African American history and literature widely during that period and during the Black Arts Movement reinforced my understanding of the importance of building Black institutions—thus the conviction that we must speak for ourselves, about ourselves. That perspective informed our path in creating We Rise, We Resist, We Raise Our Voices. STEPHAN: What was the process of creating the book like? CHERYL: Coordinating 50 different writers and visual artists on the same project can be an exhilarating experience! I’d happily do it again. Working with a large commercial publisher was a remarkably smooth experience. But we believe that was because Just Us Books was so firmly grounded and clear on what this project was about. We also had a fantastic editor, Phoebe Yeh, who got it. She was sensitive to our perspective and focus while merging into her list at a larger more commercial press. KATURA: We Rise, We Resist, We Raise Our Voices is written for middle grade readers. Can you think back (way back J) to that time in your lives; is there one thing you were doing as a 10, 11, 12-year-old that helped lay the foundation or ignite the spark for your work today? WADE: When I was growing up, I loved baseball. I wanted to become a professional baseball player. But, there was no organized little league team in my hometown. We played in our yards, or sometimes in the street. I used to read the sports section of the daily newspaper, intently observing the baseball box scores and stats. One day, I ran across a half a page spread about the upcoming little league baseball season. Of course, the league was for white boys only. Why don’t we have our own little league, I wondered? So, I set out to do something about it. I was about 11 years old. I organized some of the fellows and went door-to-door collecting money in our community to start a team and league. With the money we collected, we bought baseball equipment, though not enough, went to the high school football field without permission and started our baseball program. Every afternoon that summer we played baseball. The following summer, school administrators found a budget to support our summer league and assigned a supervisor. Several players from that summer league program went on to successful careers in professional baseball, including Vida Blue who was “Rookie of the Year” and a “Most Valuable Player” award recipient. So, even at a young age, I understood the necessity of taking the initiative. I guess that has served me well as a publishing entrepreneur. CHERYL: I was 11 years old and in the 6thgrade when my father died from a year-long battle with cancer. This was a devastating ordeal for our entire family, but I felt I grew up a lot. I made a transition from being a child to being a more responsible young adult going into junior high school. The space age had begun, the civil rights movement gained more momentum, John F. Kennedy became president and was soon assassinated. Times were turbulent. There was no way someone my age couldn’t be aware of the monumental changes in our society unless they had totally buried their head in the sand. During this time, I felt an intense responsibility to myself, for myself and for fate of my people. KATURA: Just Us Books is celebrating 30 years in business. That’s a long time and a lot of history! What’s the most memorable moment for each of you? WADE: I don’t know if there is a most memorable moment. I am most proud of helping to open doors in different ways and in different areas of publishing and marketing for people of color. When we started publishing in 1988, the landscape looked much different than it does now. Of course, we still have a long way to go and much more to do to level the playing field. We joined a long list of folks who have fought from the beginning of this country’s history to make publishing inclusive and reflective of who we are as a world population. We have helped to move the ball down the court a bit, and we are proud of that. STEPHAN: Is there anything you would have done differently in terms of managing Just Us Books as a business? WADE: When you look back, there is always something you see you could have done differently. But, you know, life is a journey filled with experiences and lessons. What’s most important is that you’re growing and learning. So, wishing we could have done things differently, I am not sure. So much has changed since we started in 1988. There is so much more information available now, and so many more people in publishing today who are more open and willing to share. There were so few of us when we started. And children’s book publishing was generally a closed society. There were very little exchanges of trade information then if you were not a member of that group. People guarded their expertise and information carefully. From the beginning, we wanted to share as much as we could with others who were attempting to enter the book publishing industry. We knew what it was like when we first started. Additionally, we know that we are part of something that is much greater than us. It is a movement in many ways. A movement cannot be about individual pursuits only! 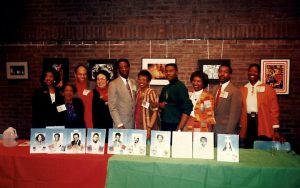 KATURA: You’ve written and or published many books, won a bunch of awards, helped give a lot of Black writers, illustrators and other professionals their start in the industry. What does success – or more importantly – impact look like for you now? CHERYL: Success looks like seeing so many more young authors and illustrators of color being published and their work having an impact on a younger generation. Success looks like seeing award-winning creators like Sharon M. Draper and Kwame Alexander and Angie Thomas and Laura Freeman on the New York Times Best seller list. Success is hearing a 30-something adult speak to us at a conference about AFRO-BETS or Bright Eyes, Brown Skin or Jamal’s Busy Day: “I grew up with those books, I love your books! 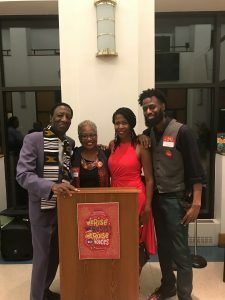 I still have your books!” Success means seeing your work in public school libraries and classroom curriculum materials and knowing that the arc of literacy is extending so more and more children of color now see themselves in the pages of a book. Success means widening the literary canon for all children. KATURA: For people who aren’t familiar with the story of Just Us Books’ founding – you started the company to produce the kind of affirming, culturally rich books you wanted for me and Stephan. That was your inspiration then. What inspires you now? STEPHAN: How has social media changed for you? CHERYL: Social media has made it possible to reach a much wider audience. 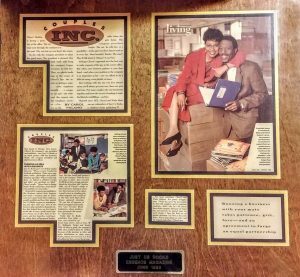 In 1988, we used direct mail and targeted print campaigns in local newspapers to get the word out about Just Us Books. We spoke at lots of conferences and community events where we talked to parents and educators face to face on a grassroots level. We still do that. But now we reach those same people and many more through Facebook, Twitter, IG and other platforms. Of course, there’s a lot more competition because of more avenues for self-publishing, as well. Access to social media has made it easier to review the wide variety of illustrations and graphic styles of artists and photographers. Back in the late 70s and early 80s, art directors relied on slide presentations and agents to see artists’ portfolios. Now you can look at art and even commission it with a click. The internet has made it possible to experience, curate and even publish so much more wonderful work. It’s a good thing! KATURA & STEPHAN: You always ask us ‘what it’s like working with your parents?’ We’re turning the tables. What’s it like working with your kids? STEPHAN: What’s next for you and for Just Us Books? CHERYL: We’re working on a number of projects, both individually and under the Just Us Books umbrella. 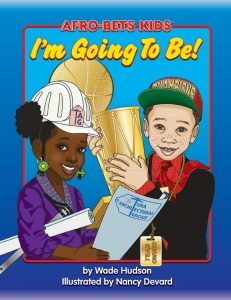 One picture book that’s coming soon is called I’m Going To Be, featuring the AFRO-BETS Kids and beautiful illustrations by Nancy Devard. The AFRO-BETS Kids helped us launch Just Us Books 30 years ago – so we’re excited to have a new title featuring them. My personal goal is to complete a fabric art and story-quilt project I’ve been working on for years. I hope to publish an artist’s book and a multimedia music & art presentation within the near future. There’s new nonfiction biography on outstanding Black women, a project I’m working on with illustrator Erin Robinson that’s scheduled to be published in 2019. For Just Us Books, we plan to continue publishing carefully curated children’s books and sharing our stories with this generation and having fun while we’re doing it.